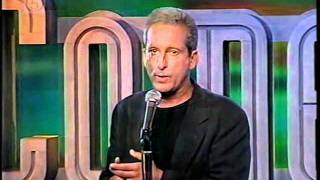 Bobby Slayton, "The Pit Bull of Comedy," is charging ahead in full force. Slayton has just released his debut CD entitled Raging Bully, a one hour live recording that is guaranteed to take no prisoners when it comes to laughs. At the same time, Slayton shows his tremendous versatility by playing the part of Joey Bishop in the HBO original movie, The Rat Pack. He has starred in his own acclaimed HBO "One Night Stand" special, and it's not surprising that everyone from "The Tonight Show" to "The Howard Stern Show" has welcomed Slayton's brazen brand of humor to their shows. For the past several years, he as been a favorite featured performer at the legendary "Just for Laughs" comedy festival in Montreal. In addition, Slayton continues to sell out comedy clubs across the country, while the American Comedy Awards voted him the Funniest Male Stand-Up Comic of the Year.The gravely voiced Slayton freely admits, "I offend everybody." As an equal opportunity offender, he takes on every stereotype under the sun, often in raw, scorching terms. But his wry observations are never vicious. The quick-witted, acid-tongued Slayton is on stage to have fun with the audience. Then, of course, there is his famous battle cry, "If you can't laugh at yourself, make fun of other people."